Item is a folded holiday greeting card affixed with string. Item is a folded holiday greeting card sent and received by members of the Hicks family. 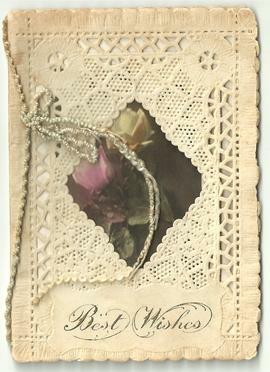 Item is a folded holiday greeting card affixed with string received by the Hicks family. Fonds consists of Anna Cummings’ junior sewing notebook and life member certificate of the Mount Allison Federated Alumni for Anna Cummings', Ladies’ College Class of 1927, 29 July 1969. Item is a photograph of the Eastern Hay & Feed Co. building, located in Moncton, NB, beside a railway crossing. 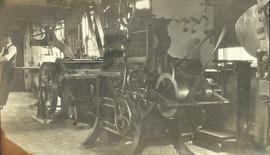 Item is a photograph showing a section of the cutting room on the 1st floor of the Paper Box Factory.